It is estimated that freshwater accounts for approximately 2.5 percent of the water on Earth; the rest (>97%) is saline and ocean-based water. However, not all the 2.5 percent (freshwater) is accessible as most of it is trapped in glaciers, snowfields and ground water. What is left is a meagre 0.01 percent of water which is freshwater from lakes and rivers. When divided by 7.4 billion people and all living organisms, accessible freshwater is arguably one of the most important and scarce commodities on Earth. Ensuring the sustainability and purity of this precious life-sustaining commodity should be a top priority. Yet when studying the sustainability and purity of water, water-studies focus mainly on its physical purity and distribution. Should these criteria be the only focus of such studies ? Through spiritual research, we have found that the spiritual dimension affects every aspect of our lives. It is logical to assume that soil and water along with the environment are affected at a subtle level. In a research article titled ‘A Spiritual Study of Soil’, we outlined how the human race is affecting the land (soil) and environment at a subtle level. 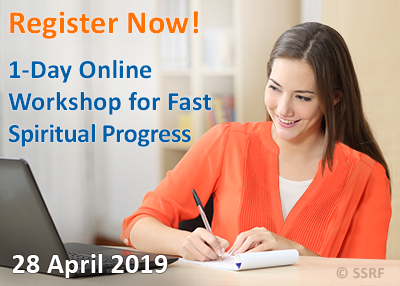 A parallel study on water was also undertaken by the Maharshi Adhyatma Vishwavidyalay (MAV, also known as the Maharshi University of Spirituality) and the Spiritual Science Research Foundation. The study of the subtle properties of water commenced in February 2018. The purpose of the study was to analyse water samples collected from around the world to gauge differences in subtle vibrations and subtle properties based on region and the type of waterbody. 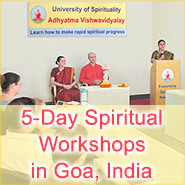 Both the soil and water studies were commissioned by the University (MAV) to assess the spiritual status of the environment in the current era. A wide variety of samples from various types of waterbodies in various places are obtained (details given below). The subtle vibrations of the samples are minimally impacted by other stimuli from the time of collection to the measurement of the sample. This was so that the original vibrations of the sample would be retained until measurement. To minimise the time from collection to measurement to approximately 2-3 days. Actually, such a subtle analysis can only be undertaken using a person’s sixth sense, which needs to be of an advanced level. However, nowadays with advancements in aura-and-subtle energy scanners, the spiritual research team is able to measure the subtle vibrations (associated with objects) to some extent with these instruments. To measure the subtle vibrations and aura of the water samples, the Universal Thermo Scanner (UTS) was used. It is an instrument developed by Dr Mannem Murthy (a former nuclear scientist from India). 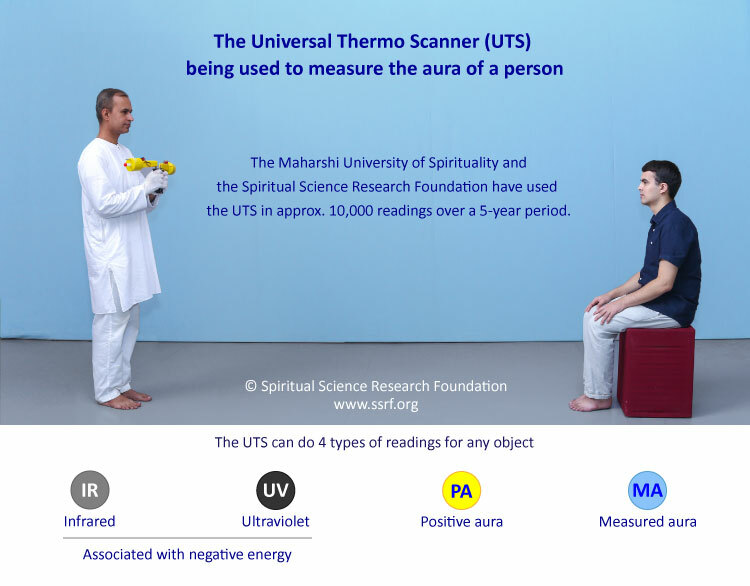 The UTS is used to measure the subtle energy (positive and negative) and the aura around any object (living or non-living). The negative subtle energy readings are of 2 types and are denoted by IR (Infrared) and UV (Ultraviolet). The IR reading measures and indicates a lesser form of negative vibrations and the UV reading measures and indicates the more intense form of negative vibrations. UV readings are usually related to negative vibrations at the level of demonic possession. Over a 5-year period, the spiritual research team has used this instrument extensively, conducting approximately 10,000 subtle energy and aura readings of various objects (living and non-living). It has been the team’s experience that the UTS is quite accurate and UTS readings taken by the research team have corroborated the team’s readings obtained through sixth sense. It is important to note that while instruments like the UTS are great spiritual research tools, a true measure and analysis of the subtle vibrations from any object (which in this case are water samples) can only truly be conducted via sixth sense, which needs to be of a very advanced level. The below map shows all the countries where water samples have been collected from, and they have been depicted in light blue. 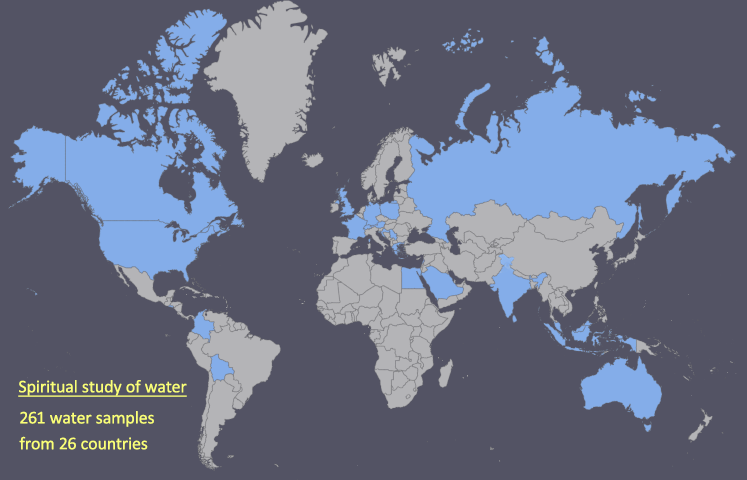 As of 20 March 2019, using the UTS, a total of 261 water samples have been collected and analysed from 26 countries. The spiritual research team categorised the samples into the following sub-categories. 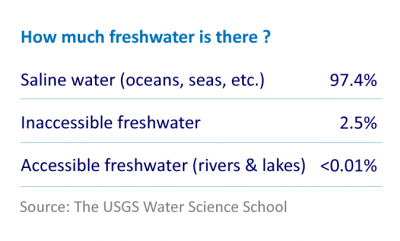 The picture below shows the type of waterbody and the number of samples. In the chart below, the percentage of samples that showed positivity and negativity have been displayed. Some samples showed both positive and negative subtle energy and have been termed as ‘both’ in the below chart. There were also a few samples that neither recorded positive or negative subtle vibrations and were termed as ‘neutral’. As one can see from the above chart, when observing samples that were collected from outside India, there was a sharp rise in the percentage of negativity. 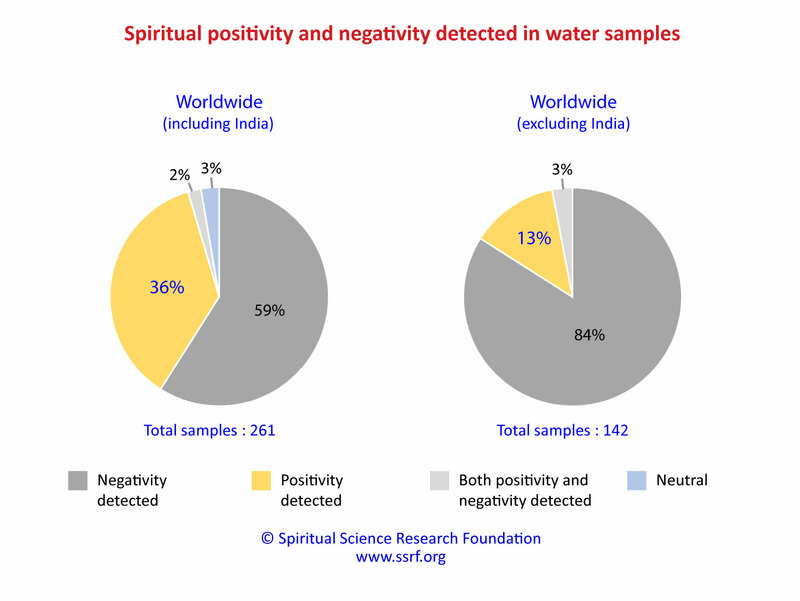 84% of the samples outside India recorded negative vibrations. In contrast, out of the 119 samples that were collected in India and analysed, only 29% of them recorded negative vibrations. This is the reason why the overall worldwide percentage of samples that had negative vibrations was much less, that is 59%. Also 37% of water samples from outside India had a UV reading, while only 13% of water samples from India had a UV reading. Refer to the section in the soil study which explains the importance of India from a spiritual perspective. The following is a list of countries (sorted alphabetically) and the number of samples that have been collected from each country. The table also shows the percentage of samples that were observed to be positive vs. negative. Positive vibrations in the water samples were found in only 11 of the 26 countries. The maximum number of samples for a country that were collected were from India (119 samples). The following two charts show the highest levels of negativity and positivity that were found in each category. This is important as it shows the extent of the range of positive and negative vibrations one can have in any given waterbody. In the first chart, the maximum negative auras have been displayed. This means the samples that had the highest IR and UV readings recorded by the UTS for that waterbody. As one can see from the above chart, the maximum negativity was found in tap water. 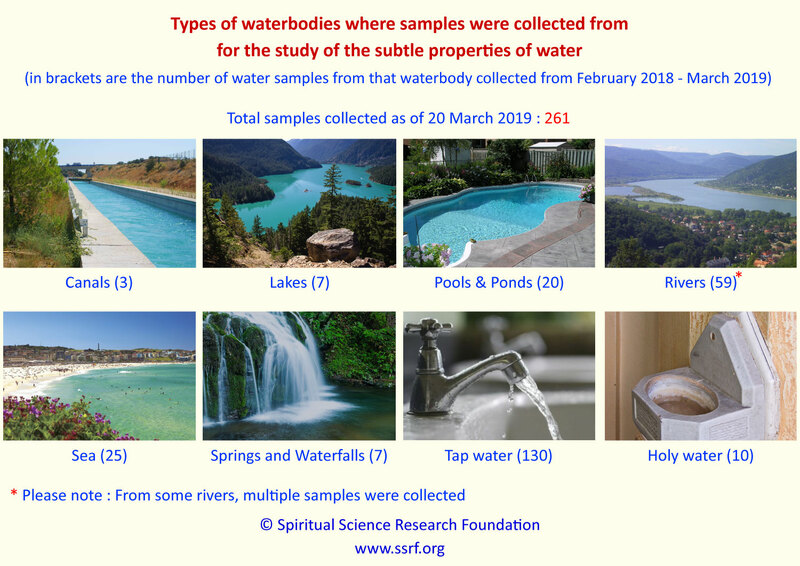 What was surprising was that out of the 10 Holy water samples collected from places of worship / religious places across the world some were found to have high levels of negativity. 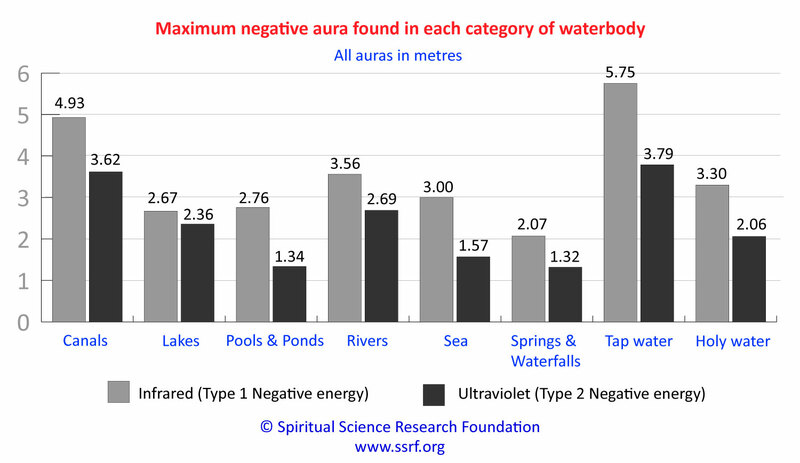 The maximum negative aura in a Holy water sample was found to be 3.3 meters IR and 2.06 metres UV. This also means that in some cases negative energies had tainted some of the Holy water samples where in instead of being helpful to devotees they would in fact be detrimental. Also, we often associate spring water with purity. However, if the land that it flows through has negative vibrations then this is most likely to pass on to the spring water making it unfit for consumption from a spiritual perspective. 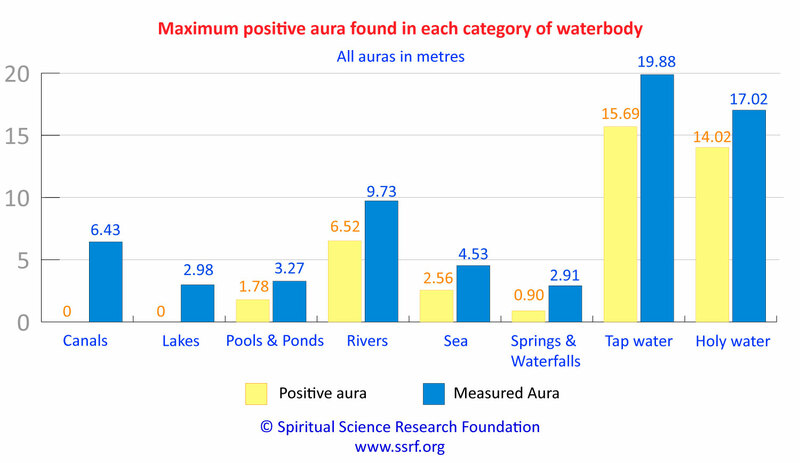 In the chart below, the maximum positive aura that was found in samples from various waterbodies is shown. On the flip side, we also found positivity in 36% of all the samples in this study. The above chart shows the amount of positivity each water type had. For example, the most negativity found in a tap water sample was 5.57 meters IR and 3.79 meters UV. In contrast, the most positive tap water sample had a positive aura of 15.69 metres. Refer to the tables of the top 10 positive and negative samples for more details on which were the most positive and negative samples. In some water bodies, such as canals and lakes, up to now none of the samples in these categories have shown any positive aura. However, lakes are often vital sources for drinking water and not having any positivity could spiritually compromise society when consuming such drinking water. It is also pertinent to note that Holy water readings could be very positive if the environment is positive and the manner in which it is ritualistically prepared is spiritually proper. 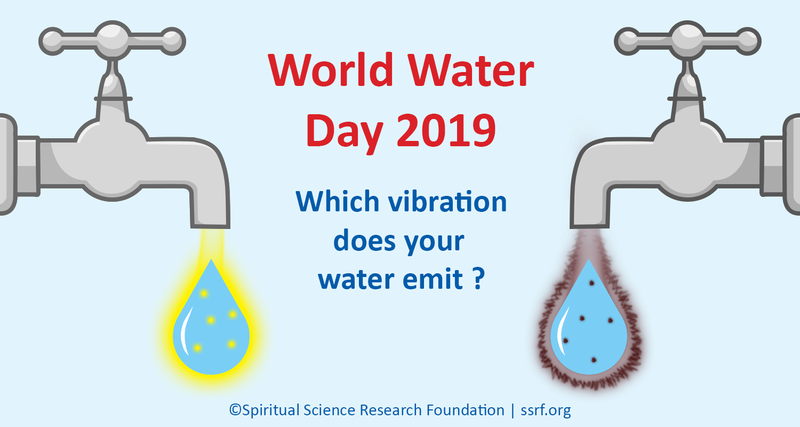 These charts show the care that is needed to be given by priests when charging water so that it emits spiritually pure vibrations and hence can be deemed Holy. The top 10 samples that emitted negative vibrations and which had a negative aura are given below. The data in the table has been sorted by IR Type 1 negative energy reading. All figures measuring auras of the samples are in metres. It is alarming to note that 4 of the samples in the list of the top 10 negative samples were from mineral water bottles. It goes to show that physical purity does not equate to spiritual purity. Also, the current top 10 most negative samples (in the study) have all been collected in 2019 itself and have eclipsed the previous top 10 negative water samples of 2018. This is an important point as it can be an indication that the overall negativity found in waterbodies is increasing worldwide. This phenomenon is in line with what SSRF has been stating all along – that there is in a strong increase in the spiritual impurity worldwide. This increase in spiritual impurity will finally manifest in the physical dimension in the form of the Third World War and extreme natural disasters. In the following chart, the 10 most positive samples have been listed. The data in the table has been sorted by the positive aura. All figures are in metres. 1. We were curious to know if filtered water from the Spiritual Research Centre and Ashram was boiled but not kept in the room of His Holiness Dr Athavale, what would its readings be ? In the table below, a comparison of readings is provided. 2. It is common for people to negatively affect water due to any negativity in their aura, and the effect of this is commonly seen in enclosed pools like swimming pools. In contrast, despite millions of people taking a dip in the Triveni Sangam, in Prayagraj, which has the confluence of three rivers — the Ganga, the Yamuna and the Saraswati, the waters at that point seemed to increase in positivity during such auspicious days. The Ganga and Yamuna are quite heavily polluted at a physical level, but this does not affect their spiritual purity. Please refer to article on – How safe is mineral water or bottled water ? Which are the most spiritually pure rivers ? Does 100% pure mineral water mean that it is really pure and good for your family ? The unique behaviour of the River Ganga – focus on the Kumbh festival. Can we change the spiritual purity of water in our homes ? Is it better to swim in a pool or in the sea from a spiritual perspective ? How can Holy water have a negative aura ? How will I know if water is spiritually impure ? People have a myopic view when it comes to assessing the purity of water. Physical purity is usually the only aspect of water-purity that is considered. We never take into account the spiritual purity of water. Perhaps the only time we put a spiritual value to water is when it comes to Holy water from a place of worship or if there is a spring that is popularly known to have healing properties. But even here, there is a lack of understanding as to whether such water is indeed holy, or if we consider it so just because the rest of the world considers it to be so. Yet, what this study has shown is that every water sample is different and has its own unique subtle signature. With the majority of water samples being negative, it should be a cause for concern for us. The effect of drinking water that is spiritually impure has short and long-term repercussions on our spiritual well-being. 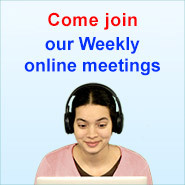 If our spiritual well-being is compromised, it can manifest as various problems at a physical and psychological level. Ingesting spiritually impure water or bathing in it is something that we should ideally try to avoid. Unfortunately, in practical terms for the vast majority of us, this is something that we cannot avoid. One way of protecting ourselves from such problems is through regular spiritual practice such as chanting the Name of God and adopting spiritual healing measures such as the ‘Saltwater spiritual remedy’. Regular spiritual practice enhances the positivity at home or the premises which in turn will have a positive effect on the environment. A positively charged environment will have a positive effect on the soil and water, and a healing effect on the people who live there.